Detecting your protein of interest by western blotting, in tissue lysates (problem 1) or immunoprecipitation (IP) samples (problem 2), can be challenging. This is due to the presence of endogenous immunoglobulins in the samples, which can be detected by conventional secondary detection reagents. This problem is particularly common in certain tissue types, such as thymus (Figure 1), which contains a significant number of immunoglobulins. These immunoglobulins become denatured and reduced during the sample preparation and SDS-PAGE stages of western blotting protocols. In IP experiments however, antibodies/IgGs are released from beads during the IP procedure especially when using stringent elution methods, like Laemmli sample buffer containing SDS and reducing agents. The IgGs/antibodies, which have been eluted off the IP beads along with your protein of interest, then become denatured during the IP sample preparation procedure. They are detected by conventional heavy and light chain secondary antibodies used in western blotting experiments. 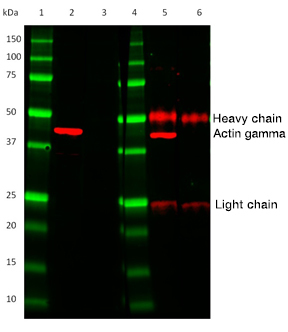 This binding results in the visualization of two distinct bands on your western blot; the IgG heavy chain at ~50 kDa and the IgG light chain at ~25 kDa (Figure 2). TidyBlot HRP conjugated Western Blot Detection Reagent (STAR209P, STAR209PA and STAR209PT) only binds to the native primary antibody during the incubation of the western blot enabling the detection of your protein of interest in these two challenging sample types, without interference from IgG heavy and light chains. Fig. 1. Comparison of actin gamma detection in mouse thymus lysate using Goat Anti-Mouse IgG (H/L) or TidyBlot Reagent as secondary detection reagents. Precision Plus Protein Prestained Standards were run in lanes 1 & 4. Mouse Anti-Actin Gamma PrecisionAb Antibody (VMA00049) was used in lanes 2 & 5. Lanes 3 & 6 are secondary only controls. 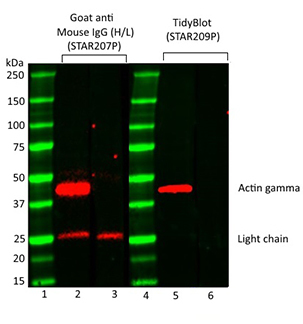 HRP conjugated Goat Anti-Mouse IgG (H/L) Secondary Antibody (STAR207P) was used in lanes 2 & 3. TidyBlot Western Blot Detection Reagent:HRP (STAR209P) was used as the secondary reagent in lanes 5 & 6. Please note that TidyBlot Reagent is HRP conjugated and that the western blot bands (red) and protein standards (green) have been pseudocolored. Fig. 2. Comparison of HRP conjugated TidyBlot Western Blot Detection Reagent (lanes 2 & 3) to a standard anti-mouse IgG (H/L) secondary antibody (lanes 5 & 6). In contrast to the anti-mouse secondary antibody, TidyBlot Reagent only binds to the Mouse Anti-Human Actin Gamma PrecisionAb Antibody (VMA00049) used for detection (lane 2). Lanes 3 & 6 are no primary antibody controls. Please note that TidyBlot Reagent is HRP conjugated and that the western blot bands (red) and protein standards (green) have been pseudocolored. The table below summarizes the two main western blotting problems that TidyBlot Reagent helps you solve. As TidyBlot Reagent only binds to native non-denatured antibodies immunoprecipitated proteins of ~50 kDa and ~25 kDa can be easily visualized without any obstruction. As TidyBlot Reagent only binds to native non-denatured antibodies trouble-free western blot detection of tissue lysates can be performed (low background risk).